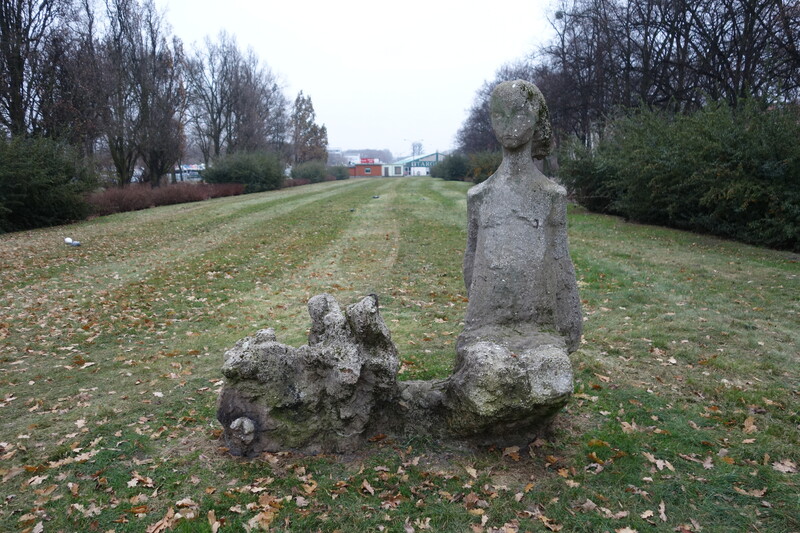 Despite the cold, Anka, Małgosia and I visited a few other sites associated with Jewish culture and history. 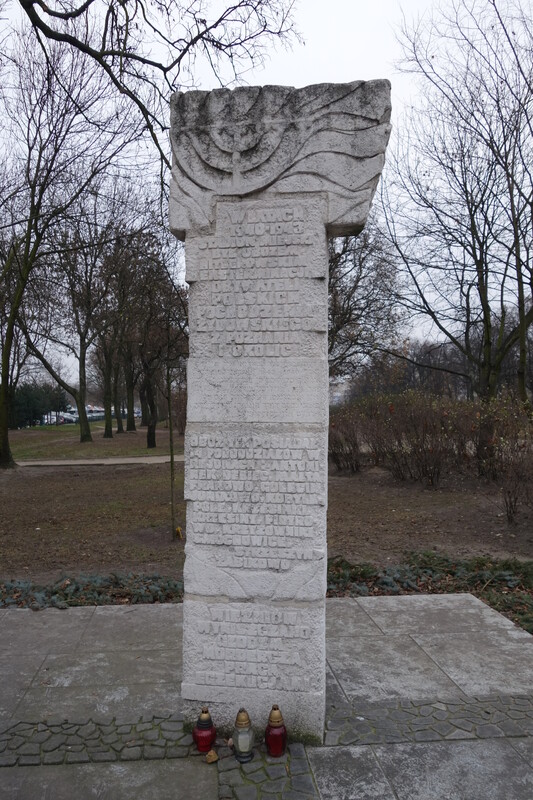 The monument to the victims of the Poznan labor camp is on Królowa Jadwiga Street even though the actual detainment site was a block away in the old football stadium. The socialist-era monument is a tall concrete pillar with what looks like a menorah at the top. Anka pointed out the dedication on back of the monument stating it was erected on the 40th anniversary of the Warsaw Ghetto Uprising; even sites commemorating local events reproduce the idea that the Holocaust happened elsewhere—in cities such as Warsaw and Krakow. 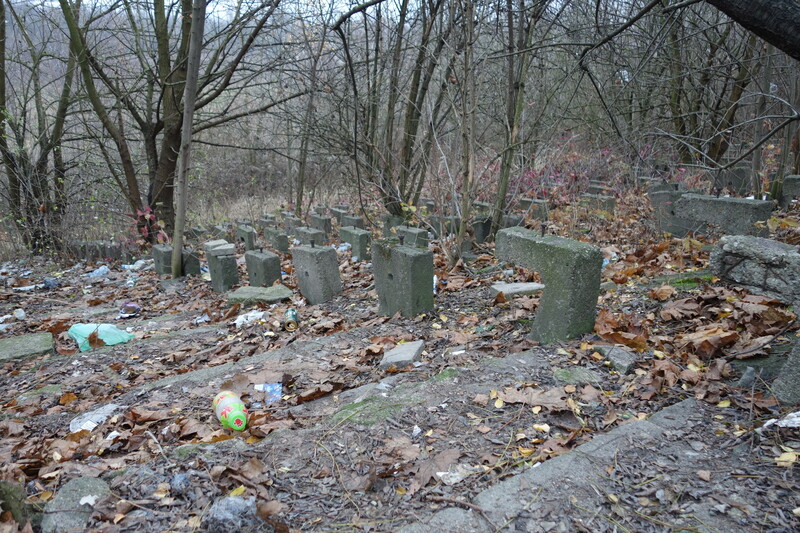 The actual stadium was abandoned in the 1990s when a new one was built for the Warta football team. Warta is Poznan’s smaller club, rival to Lech, who got a big new stadium for the European football championship Euro 2012. Małgosia conducted ethnographic research in which Warta fans turned out to be the only ones who know the function the stadium served during the war. Essentially, it was a work camp where Jews were briefly held before being shipped off to the death camps. Many detainees were shot right there on the spot. We walked through the broken down gateway, up a set of stairs to an earthen berm surrounding what used to be the playing field. Today, the site is covered with trash, and trees grow everywhere including where the bench seating used to be. Only the concrete supports of the benches are left. Goal posts stand on the field, left over from 2012 when local teams competed in a kind of lighthearted protest against the massive outlay of funds for Euro 2012. Looking out from the old football stadium toward the outdoor market and new high-rises. For the most part, this is forgotten space, despite its proximity to the center of the city. 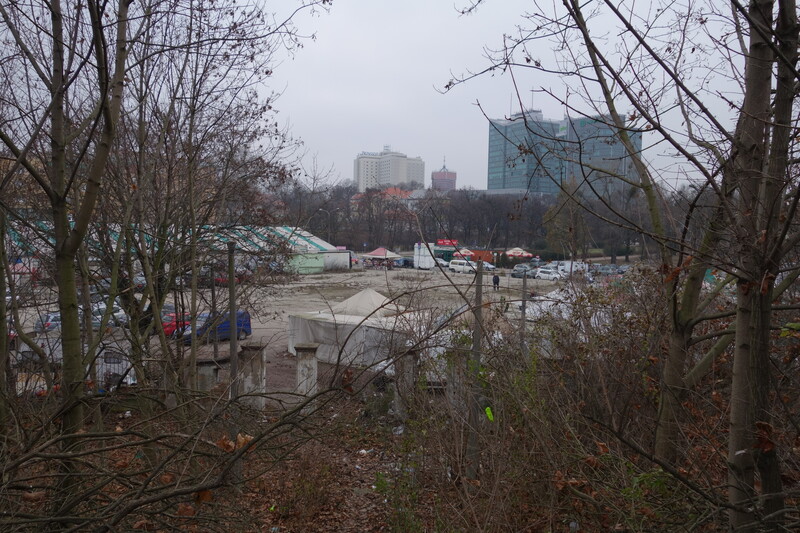 It is separated from Królowa Jadwiga Street by a dilapidated outdoor market. On this frigid day, there were no customers, just very cold sellers who urged us to their buy their wares. I was told the outdoor market used to be bigger. When they were in high school, it was the place to get real Adidas and blue jeans. With all the competition from new shopping centers, the market has shrunk. There is an ongoing debate about what to do with the old stadium—what primary purpose should the space fill? Should it be a place for sports activities? A nature preserve? A place of commemoration for those who suffered and died there? Or should it become another housing development or mall? What is the origin and meaning of this sculpture? Why is it in the newly named Square of the Righteous among Nations of the World? Heading back toward the center of the old city to thaw out at a café, we chanced upon an unmarked, decaying stone sculpture. I think it was Małgosia who said it suggests some sort of Holocaust memorial. Then we noticed the sign designating the area as “Square of the Righteous Among Nations of the World.” I’ve since learned that this is a new name, approved by the city just this year. We made two more brief stops on our tour. 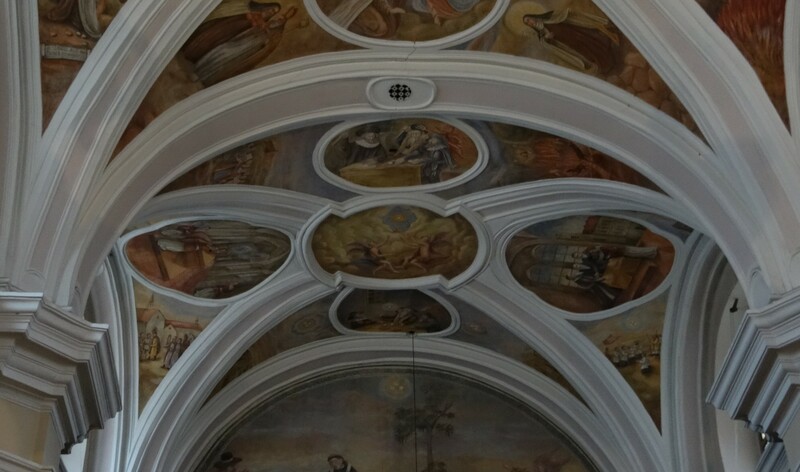 We peaked into the Church of the Most Holy Blood of Christ (Najświętszej Krwi Pana Jezusa) on Żydowska (Jewish) Street, where I showed Anka and Małgosia the ceiling frescos depicting Jews profaning the host. Have Mercy on Us, Have Mercy on Us, Have Mercy! The song recounted the story of three hosts stolen by a Christian woman from a Dominican church in Poznań in 1399. According to the story, she delivered the three hosts to Jews who desecrated them, “stabbing” them with knives. Unable to dispose of them, the Jews took them outside the city and buried them in swamps. The hosts miraculously emerged to reveal themselves to a shepherd boy. The Christian woman and the Jews were punished by the magistrate, and the Church of Corpus Christi was constructed on the site after the miracle (2011: 89-90). Teter goes on to suggest that this story might have been used as a rationale for building a new church on Żydowska Street. Pani Alicja, the head of the Poznan Jewish Community, told me that she has been waging another battle to have an informational plaque installed in the entranceway of the church explaining that the story of the profaning of the host is a legend, not historical fact. To date, church representatives have only agreed to post an explanation in the basement where most people will never see it. The exterior of the former “new” synagogue in Poznan. The words “Pływalnia Miejska” (City Pool) can be made out above the long central windows. The pool was closed just three years ago in 2011. 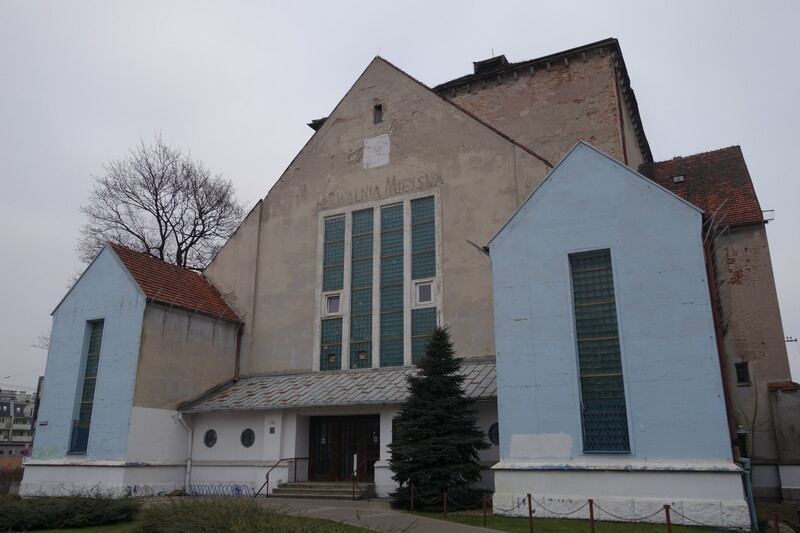 Our final stop was the former synagogue near the end of Żydowska Street. When built in 1907, it was considered the “new” synagogue. It could hold 1200 worshipers, and was richly ornamented with a copper dome. During the war, the Nazis stripped off the dome and transformed the synagogue into a swimming pool. It continued to function as a pool even after the Jewish Community regained possession of the building in 2002. Małgosia has seen the interior. She described how the bottom of the sanctuary was tiled with the pool at the center, but the upper part remained just like a synagogue. She also said she has been in the attic above the wooden beams of the sanctuary which is still filled with old papers and books. The building is in bad shape and in need of major renovation. Efforts have so far failed to turn it into a Center for Dialog and Tolerance (see this essay by Janusz Marciniak, which includes photos of the exterior in 1907 and today. An essay by Teddy Weinberger describes his visit to the synagogue when it was still a pool; he includes photos of the interior as a place of worship and as a swimming pool).